What’s more exciting than swimming with a Humpback whale? Getting to meet its adorable calf as well! To find yourself face to face with a massive Humpback whale is the experience of a lifetime. No one can guarantee that whales will show up to make your acquaintance. Even if you do manage to find them, they tend to be shy and may quickly swim away the moment you arrive. This is even more true of a mother with her calf. Like all animals, Humpbacks are protective of their young. 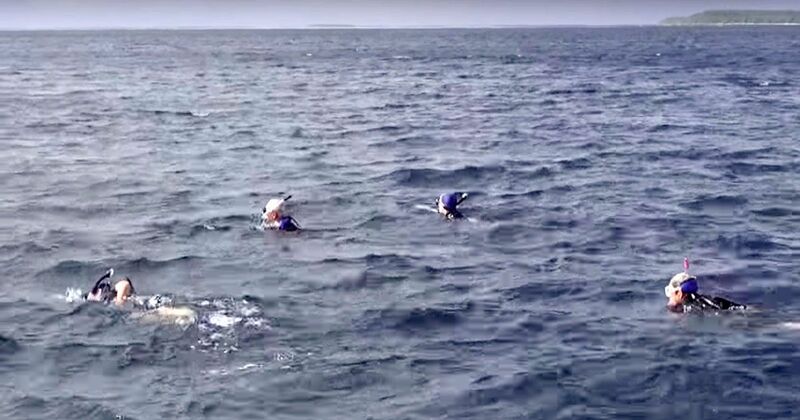 As though a baby whale sighting weren’t amazing enough, these lucky swimmers also got to hear the animals call and coo at one another. It is basically the best kind of sensory overload. The meaning of whale noises and songs is still largely a mystery. Scientists have found 34 distinct noises and are just beginning to decipher them. Some are easy to understand – a mating call or a mother’s call to her calf – but others are more complicated. We may never know exactly how these whales communicate and why. New evidence also that suggests Humpbacks are an empathetic species. Reports of these huge animals going out of their way to save other whales, seals and sea lions from killer whales are making a splash. One study compiled 115 different reports of various rescues. Only 11 percent showed cases of Humpbacks protecting their own calves. The other 89 percent were inter-species rescues. Humpback whales are often able to thwart killer whale attacks using their large bodies. This has led some scientists and reporters to call these gentle giants the saviors of the sea.